"Some of the other marathoners would probably laugh at it. But 80 minutes used to be a long run for me. Now it's just my normal morning run. I've pushed my volume up to 95 to 100 miles a week." "It's the number one thing people have said to me when I bump into them at the running store or some place. They say, 'Make sure you respect the distance.' And you know what? I don't know what that means. I don't want to cloud my head with a lot of scenarios. I know I'm not going out in 1:01 for the first half. It's more likely to be 5:10s going out. Whatever, I just want to keep it simple. I just want to find the players, to stick with the lead pack, and to come home strong the last 5K." 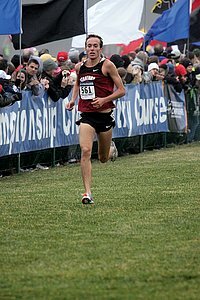 - 8:19 steepler Brian Olinger, talking about his preparations and thoughts ahead of the US Olympic Marathon Trials. Olinger qualified with a 10k time and this will be his first marathon and first race longer than 7 miles. 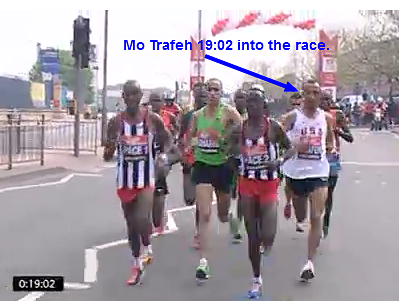 One of the marathoners who might laugh at his comment could be Meb Keflezighi, as he actually said word for word in his interview, "No matter how it's run, whether it's uphill, downhill, or flat, a marathon is 26.2 miles, and you have to respect the distance." What university will Vigilante coach next? "The fastest people I know all have these three things in common: ..., ..., ..."
What's the most ridiculous claim you have heard from a non runner? 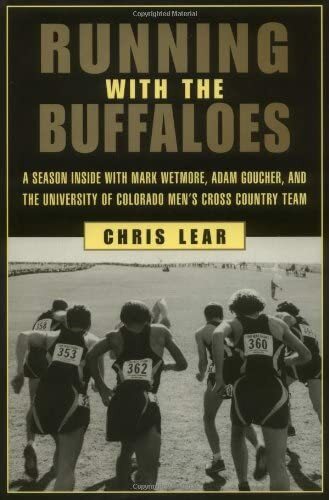 Video Workout/Interview With Former DIII All-American Chris Erichsen, Who's Training For The Olympic Marathon Trials He's only run 2:18:24 (in his 2nd marathon), but the emailer who sent this to us said, "I'm not saying Chris is going to make the Olympic team. I'm not even saying he'll be top 10. But ... I know he's on the verge of something special. He's not sponsored, he's not being called a contender. But semi-pro, pretender or whatever you want to call him, when people start chattering about the Hall's, Ritz's and Meb's at the halfway point, a guy from southeastern Minnesota is going to be throwing knock-out blows as he moves up through the field somewhere not too far behind." Usain Bolt: "I want to do wild things at this Olympics - that's my focus. I want, at the end of the Games, for people to sit down and say, 'Did that really happen?'" 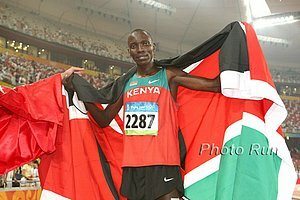 *David Rudisha To Open Season In Melbourne In March As in 2011, he'll be focusing on winning, not breaking his WR in 2012. *"The London Olympics Could Usurp Sydney As The 'Best Games Ever'"
Indian Olympic Association Decides Not To Investigate Corruption In Their Sports Well the IOC and IAAF don't seem to care either, so why shouldn't the IOA follow their example? Recap Of Japan Boys HS Ekiden Champs: Sera H.S Dominates In 2:03:50 That's 4:43 pace for a marathon spread out among 7 high school runners. Top stage splits included 29:38 for a 10k and 14:13 for a 5k. Recap Of Girls Ekiden Champs: Kenyan Beatrice Murugi Wainaina Leads Toyokawa To A Close Win In 1:07:29 That is 5:08 pace for a half marathon spread out over 5 HS girls. Fastest 5k split of the day was 15:20. Interview With Mo Farah On Putting Training Above A Family Christmas He left his family behind for the holidays to train in Kenya. *Evans' Surgery Was Put On Hold So Docs Could "determine the type of tumor he has before taking a course of action." Video: Eurosport Interviews Michael Johnson & Has Him Reflect On His Career He says he's most impressed by his own longevity and consistency. "At this level, anybody can win it once." Uganda Paper Asks: "Who killed Wanjiru the international champion?" Yes, mystery surrounds his death, but know an extramarital affair and alcohol played a big role. 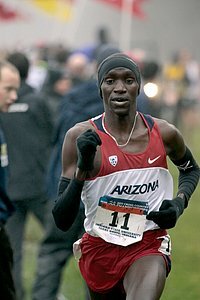 Marathon World Record Holder Patrick Makau Says Training Is Going Great & He'll Run Dubai Half In February Acutally he said of his training, "Things couldn't be better." 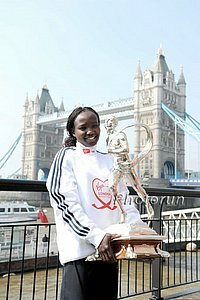 Joyce Chepkirui Wins Toby Tanser's Shoe4Africa 5k Race In Kenya Earlier this month, she ran the Olympic "A" in Australia (31:26). 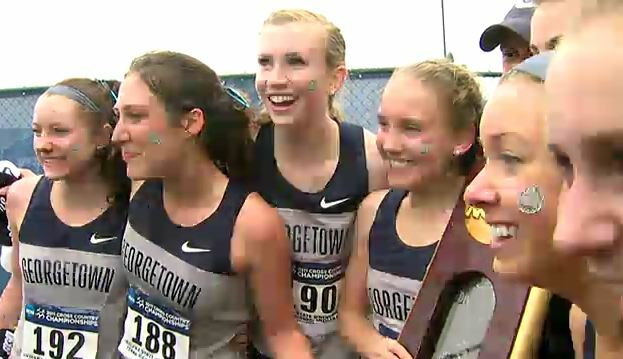 Now she's picking up $1,500 in Kenya as she got the course record with a 16:17. Saturday: Shoe4Africa Race In Iten Is Free With $1,000 For A Course Record Just wait until it's the Rock N Roll Shoe4Africa race. 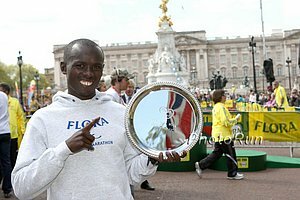 3-Time London Champ Martin Lel To Run Dubai Marathon On January 27 Lel was runner-up in London this year ahead of Patrick Makau in one of the most impressive performances of the year. Emerald Nuts Midnight Run In Central Park On New Year's Eve Women's field will include former race winner Carmen Douma-Hussar and DII 10k champ Sarah Porter, as well as Katie DiCamillo, Stephanie Pezzullo, Lesley Higgins and Sarah Cummings. Men's side led by 2-time champ Christian Hesch, Manchester Road Race runner-up Landon Peacock, Stephen Pifer and Tim Ritchie. Can Toyota Defend Its National Title? New Year Ekiden Preview Watch online Sunday, Jan. 1st at 8:30 a.m. (Japan Time). Edwin Moses Gives Dai Greene Advice On BBC Radio (Airs Jan. 1st At 11A.M. UK Time) Edwin Moses: "People are going make you the saviour of the Olympics and put the medal around your neck even before you get the chance to start and finish your training ... my advice to you is to have the arrogance to say look we'll wait and see, we'll see when the day comes." "Weeping, Wailing As Sunday Bada Goes Home"
Big Party Planned For Caster Semenya's 21st Birthday We're still waiting for our invite. Recap Of Irish Marathon/Half Marathon Performances Five went under 2:20 when in the last 4 years, only two had. Mark Kenneally led with 2:13:55, although with a 1:00:49 half marathon best, if Alistair Cragg ever finishes a full marathon, he should crush that. Japan Running News' The Top 10 Japanese Men Of 2011 Tsuyoshi Ugachi got the top spot with his 1:00:58 half marathon, but Yuki Kawauchi (only 4th on this list) is still LRC's #1 blue-collar hero. *The Top 10 Japanese Women 5k national champ Megumi Kinukawa (15:09.96) tops the list. Solid 2011 For SA Athletes LJ van Zyl, Caster Semenya and Oscar P led the way. Philip Hersh Names His End Of Year Awards Chooses Vivian Cheruiyot as world woman athlete of the year and Patrick Makau as men's world performance of the year. 11 Days After Getting US 4 X 1,500 Record, North Shore Girls Run 11:43 DMR For #6 All-Time Splits were 3:31.9, 64.1, 2:20.0 and 4:47.2. RRW's Article On The Death Of SA's Zithulele Sinqe Adds some more details that the earlier article we posted didn't. Usain Bolt's DQ And Geoffrey Mutai's 2:03 Numbers 1 And 4 On SI's Top Sport Stories Of 2011 "It was a bit like seeing Old Faithful oversleep or Big Ben lose track of time." IAAF: 2011 - End Of Year Reviews - Long Distance, Track If you didn't pay much attention to track action in 2011, read this and you'll be all caught up heading into the Olympic year. Euro XC Champ Fionnuala Britton (As Well As Long-D Runners In General) Acknowledged As Hardest-Working Irish Athlete "It is simply the nature of her sport. A tiny, elfin wisp of iron, Britton's regular training companion is pain, lactic acid, physical suffering. It takes a certain kind of person to accept it on a daily basis; and there aren't many of them around." IAAF Reviews The Marathons Of 2011 If you spent 2011 in a coma, this article does a great job summing up where we are in the men's marathon going into 2012. IAAF: Jenny Simpson Looking For More Of The Same In 2012 On her "slow" winning time of 4:05, she says, "Don't let anyone say you won by accident. Don't let people take away from what you've accomplished. Once you've done it, you own it." From Back In June: After D3 Outdoor NCAAs, Makrobondo "Dee" Salukombo Ran 120 Miles Back Home Over 3 Days He left without bringing food, water, money, a phone, or even a plan where to stay. He did this to raise money for his old school in the Republic of Congo. ... And Good For A Laugh: EatRunSwag's Top 5 WTF? Moments Of 2011 "The obvious highlight of last years USA Track and Field Championships was Galen Rupp's Pollen Mask, created specially for people who are sensitive to breathing in air. 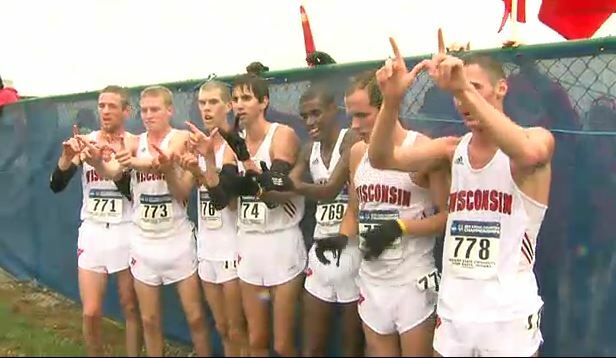 Most of the country already sees our sport as a joke, thanks for continuing to give them something to laugh at Peter Pan." Could Jamaica Sweep The 100m Medal Stand At The London Olympics? Without Mullings, that leaves them with Usain Bolt, Yohan Blake and Asafa Powell for their top 3. Maurice Greene predicts Blake to beat Bolt in London. Australia Projecting Its Lowest Medal Haul In 20 Years For London This puts a lot of pressure on Sally Pearson to win gold. She says the best way to deal with it is "Just say no to the outside influences ... It sounds selfish, but you have to be selfish to be the best athlete. I have to put my needs first. I have to put my training first and my competitions - and everything else comes second." Len Johnson Says That The A/B Standards For Walking Events Are Too Easy ... fixed. Recommended Read: Remember Dwight Phillips' Wife - Valerie (Williams) Phillips - Was Once Quite A Jumper Herself Their kids may not realize that their mom once jumped, but she's still got the high school TJ state record in MD. Dwight credits her with a coaching tip that led to his breakthrough. A great article on love, family, etc. Perfect for Xmas. Recommended Read Dyestat Takes A Look At The Amazing Ekiden Relays In Japan, Including The HS Nationals That Are Held On Xmas Imagine a US high team of 7 HS boys who have an average 5,000-meter best of 14:11.28. That exists in Japan. 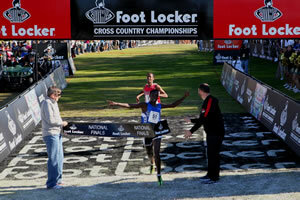 *Boys Preview: Will Wanjiru's Stage Record Fall? More Japanese News: Two Japanese Women Pick Up Olympic "A" Qualifiers - 1 In 5,000, 1 In 10,000 Yuko Shimizu ran 31:43.25; Mika Yoshikawa ran 15:15.33. Reminder: January 29th Osaka Marathon - A Japanese Olympic Selection Race - Should Be A Good One In her first marathon in 4 years, 2004 Olympic Marathon Champ Mizuki Noguchi will race the Japanese 5,000 record holder Kayoko Fukushi & 2008 Olympic Marathon Champ Constantina Dita. Fukushi ran 2:24 in Chicago. Quitters Never Win Meet Colombia's 1s 2nd-Ever World Championships Medallist - TJer Caterine Ibargüen The former HJer wanted to quit the sport when she failed to qualify for the Olympics in 2008 but now she has a bronze in the TJ. "When I failed to qualify for the 2008 Games, I felt depressed, like I wanted to quit the sport." It was pointed out to us in an email that her teammate, Luis Fernandez, beat her out for the first ever medal by 3 days in the 20k race walk.